What is the worth of informal, but focused, conversation? What do we gain from talking to each other across our differences, about something we hold in common? In contrast, the following video from the Greater Good Science Center suggests that developing “cross-group relationships” is great for our health and well-being! One of the best ways to develop more relationships and relationships with people different from us is by participating in public conversations… and we have some great invitations for you! All programs are free and open to the public. 2) On November 6th we also begin our film series, in collaboration with Maine Humanities Council, entitled “Muslim Journeys.” This series is part of a national project and will include discussion facilitated by Reza Jalali. The series includes films on November 13th and 20th – all begin at 6:30pm. 3) On November 25th we offer the second of our Portland Public Conversations, in collaboration with Lift360 (formerly the Institute for Civic Leadership) – this one will focus on “Participating in Portland” and will include a resource fair – if you have a project that engages volunteers or civic participation and you’d like to share information about it, please be in touch with me simmons@portland.lib.me.us . All are encouraged to come reflect on the value of engagement and the challenges associated with participating in our communities – November 25th 7:30am coffee/ 8:00am program start. Our final date in the series is December 9th and will focus on “Picturing Portland” – a visioning session for 2015 and beyond! 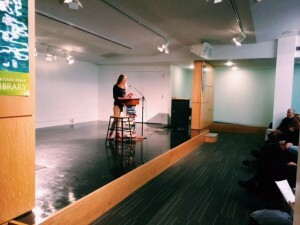 Portland poet Megan Grumbling at the Port City Poems reading. Last Tuesday, October 7, a group of local poets drew a crowd of 91 to the Rines Auditorium. 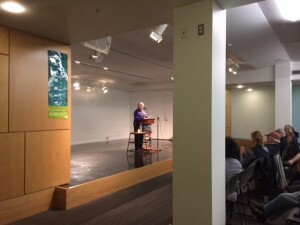 Anita Clearfield, Wil Gibson, Megan Grumbling, Claire Hersom, Annaliese Jakimides, Michele Leavitt, John McVeigh, Edward J. Rielly, Betsy Sholl, David Stankiewicz, Sally Woolf-Wade, and Anna Bat-Chai Wrobel read from their poetry. 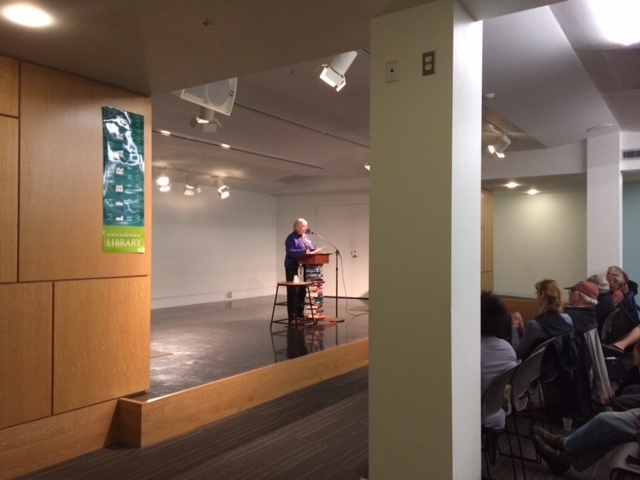 They were introduced by Marcia F. Brown, Portland Poet Laureate and editor of the anthology Port City Poems. It was an evening full of thoughtfulness and humor, celebrating Portland but also touching on other themes. For those of you who couldn’t be there, I took notes. Sally Woolf-Wade read poetry on island life. Annaliese Jakimides before the crowd. Port City Poems reader Megan Grumbling’s verse-in-spoken-opera “Persephone in the Late Anthropocene” will be performed (along with 2 other poetry-performance teams) live at Congress Square Park on Wednesday, October 15 at 6 p.m. Readers Wil Gibson and John McVeigh are both involved with Port Veritas, which organizes educational outreach and weekly poetry slams in Portland. Wes McNair will speak on his new book of poetry, “The Lost Child,” at the Main Library on Friday, October 17. You can also check out some of the library’s recent poetry additions! We recommend: Eliza Griswold’s “I Am the Beggar of the World: Landays from Contemporary Afghanistan,” Patricia Lockwood’s “Motherland, Fatherland, Homelandsexuals,” a 2014 collection from James Baldwin , or the unstoppable Mary Oliver’s latest, “Blue Horses.” And just for fun? Try Poems That Make Grown Men Cry. Inequality for All: Watch & Discuss Oct 29th 6:00 PM! That there is significant income and wealth inequality in the United States is largely undisputed. The Census Bureau reports on the federal data and the Portland Press Herald reported earlier this month on poverty rates in Maine. Yet, much about why we have growing inequality, what it really means, and what to do about it are extremely contested issues in our communities and policy debates. Earlier this year, economist Thomas Piketty opened up conversations about the distribution of wealth and made specific recommendations for redistribution. 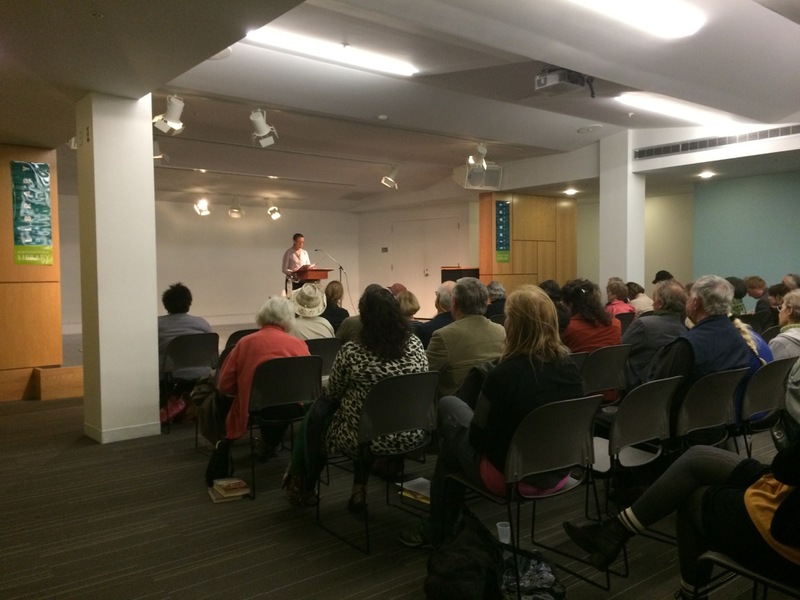 The Choose Civility Initiative and City of Reader’s Team held a community discussion on his book, as it was an unusually “hot” non-fiction title. The Rines auditorium filled– and from that evening came a request to screen and discuss Rober Reich’s film Inequality for All. On October 29th, in partnership with the League of Women Voters, Portland, the Maine Center for Economic Policy and the USM Economics Department, we will watch and discuss this movie — we hope all will feel welcome to join us for respectful and challenging discourse about this complex topic that shapes all our lives. See the booklist that emerged from recommendations given at the Piketty Panel and a booklist focused on economic inequality. What income do you think qualifies as “poverty”? How well do our poverty guidelines capture the edge between poverty and financial security? What role does the Government play in providing a safety net or incentives for higher wages? What other questions do you ask about income and wealth inequality in our Country? Submit them through comments!